How often do you change your toothbrush? How about your dog’s? Neglecting your pets’ dental health can cause significant–and costly–issues down the road. This is definitely a situation where an once of prevention can be worth a pound of cure. Sponsored every February by the American Veterinary Medical Association, Pet Dental Health Month serves to remind pet owners that brushing their pets’ teeth is good for both your pet and your budget. Unfortunately, pets’ teeth don’t get the same level of care and attention that we give our own teeth, even though they are subject to the same debilitating problems. Dr. Jan Bellows, president of the American Veterinary Dental College, acknowledges that certain foods can help pets’ teeth. 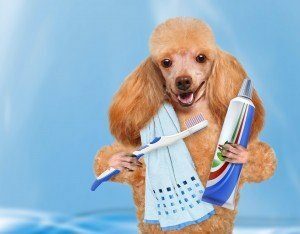 “The texture of those foods generates a mechanical cleansing effect on the surface of the tooth as the pet is eating.” This is great information for owners whose pets will not tolerate brushing. 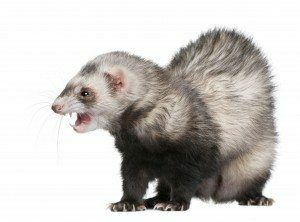 Cats and dogs aren’t the only pets who benefit from regular dental care–ferrets do, too! With a little patience and perseverance, you can persuade your fuzzy buddy to accent a toothbrush in his mouth. Start by handling and rubbing your ferret’s cheeks and mouth and getting him used to having you interact with this area. Since ferrets love any and all attention, it’s shouldn’t take too long to win him over and convince him this is a good, fun thing. Before you know it, you’ll be able to introduce the toothbrush to gently and thoroughly clean your ferret’s teeth and gums. Remember–never use human paste. Marshall’s Dental Gel for Ferrets is pH balanced and formulated with baking soda and aloe vera, and was created specifically for ferret mouths.